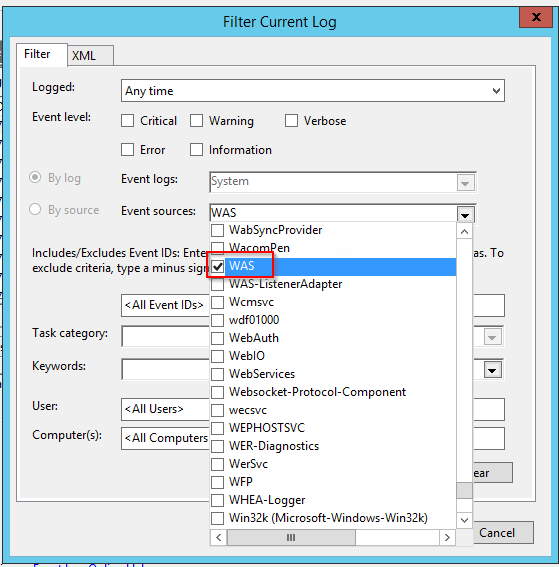 How to enable Application Pool recycle logging in IIS and where to find the resulting logs. By default not all Application Pool recycles are logged by IIS. IIS allows log entries to be created on a granular level for recycle events triggered by various causes. 1. 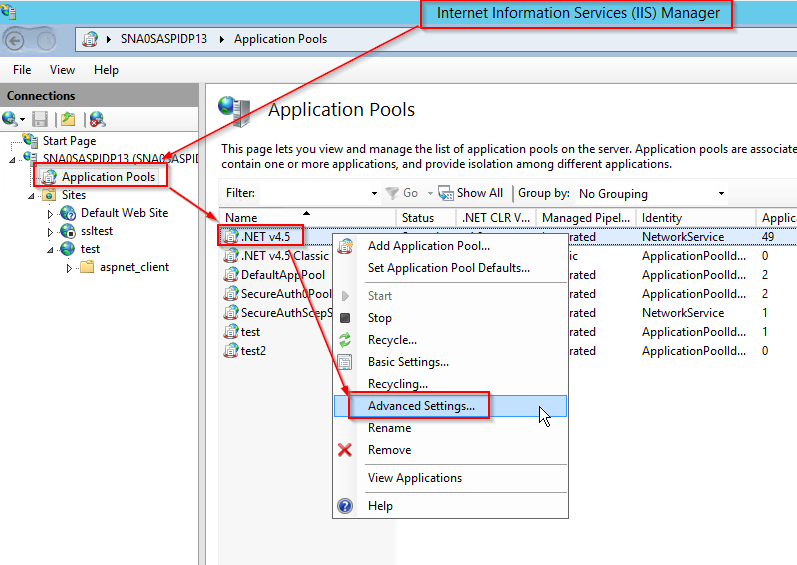 Open IIS Manager on the IdP appliance and expand the server name | Application Pools. 2. Right Click the application pool for which it is desired to log recycle events (this will usually be the pool named ".NET v4.5" unless additional custom pools are in use), then click "Advanced Settings". 3. 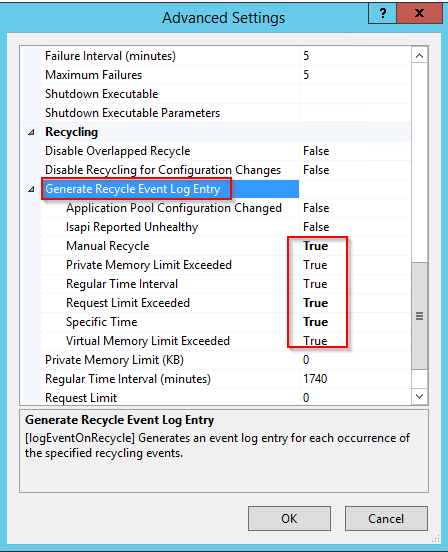 Expand "Generate Recycle Event Log Entry" then set the desired child nodes to True, then click OK.
4. 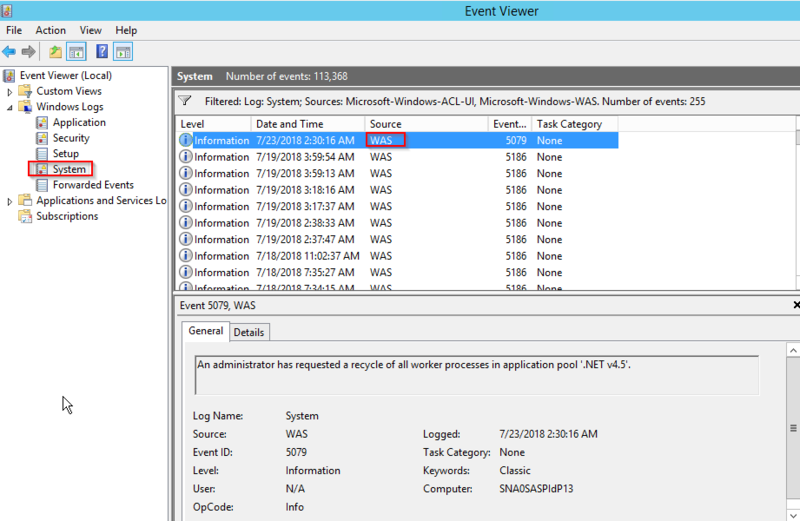 Now to view any Application Pool recycle events, simply open the Event Viewer and click on the standard System event log. 5. To view only Application Pool recycle events, add a filter to only include an event source of "WAS"
Note: App Pool recycles only trigger if there are actually any IIS Worker processes for the given App Pool running at the time. If there are no worker processes running e.g. due to inactivity, then the App Pool recycle has nothing to do and so doesn't do anything and doesn't log anything either.